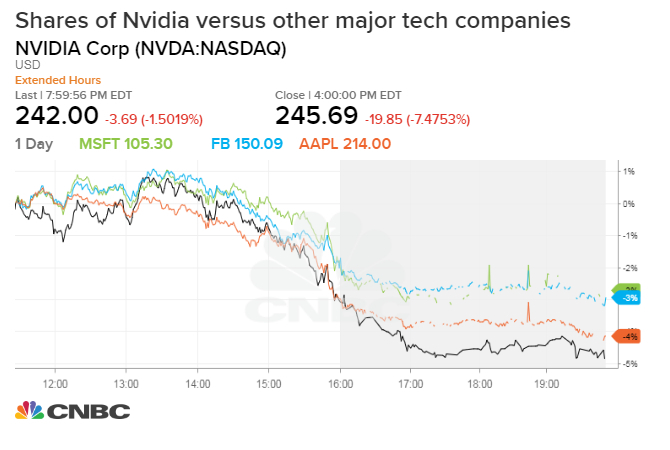 The steep sell-off in tech stocks leaves many investors wondering what happened to the once red-hot trade and where to go next. Several top portfolio managers blame a sharp rise in borrowing costs, lofty valuations and a deteriorating trade relationship between the U.S. and China. Dan Niles, founding partner of AlphaOne Capital, says he took advantage of the stress to buy tech shares like Alphabet that aren't exposed to China. "Toward the end of the day today, we started covering a lot of our shorts and started to actually pick up some longs," he said Wednesday. "We love seeing the panic." Tech shares were set to drop again Thursday, a day after rising interest rates and a trade war between the United States and China exacerbated technology's sell-off and pushed the sector to its worst levels on Wall Street since 2011. Wednesday's pullback, which contributed to the S&P 500's worst day since February, left many investors wondering what happened to the once red-hot trade and where to go next. The Dow Jones Industrial Average fell 831.83 points Wednesday as Intel and Microsoft fell more than 3.5 percent each. The Nasdaq Composite, which broke below its 200-day moving average, plummeted 4 percent to 7,422.05. The S&P 500 technology sector dropped 3.2 percent Wednesday with 52 out of 65 components — or 80 percent of the sector — closing in correction levels or worse as the sector posted its worst day since Aug. 18, 2011. "The first thing to fall will be these momentum names. I think there are a lot of risks overhanging the market. We're in a rising rate environment, and it's not just that they're higher, but that they rose so quickly," said Chris Zaccarelli, chief investment officer for Independent Advisor Alliance. "Rising rates will disproportionately affect the tech sector." The 10-year Treasury note yield traded around 3.23 percent a day after hitting its highest level since 2011. The two-year yield, meanwhile, reached its highest mark since 2008. Despite a besieged technology sector, Zaccarelli stressed that he doesn't believe it's headed for bear-market territory and that "there's no reason to panic." That sentiment was echoed by Dan Niles, founding partner of Alpha One Capital Partners, who said he took the meltdown as a buying opportunity. "We've been avoiding the semiconductor space, been short it for a while. We actually ended up covering a fair bit of our shorts today, but we think the fundamentals there are going to be awful," Niles said on CNBC's "Closing Bell." "We're trying to find names that don't have China exposure, that don't really get impacted by tariffs." To be sure, while a number of names in tech were overdue for a reassessment by the market, the sell-off presented an attractive entry point for some stocks, Niles said. "Toward the end of the day today, we started covering a lot of our shorts and started to actually pick up some longs," he said Wednesday. "We love seeing the panic on the Street. Volumes were up almost 40 percent, the traded value was up over 50 percent from what I saw." The longtime investment manager said he bought more shares of Google-parent Alphabet at the close Wednesday, citing the internet giant's insulation from the Chinese market. He also highlighted names including Microsoft and AT&T as potential bargains. A large percentage of technology companies are considered growth investments on Wall Street, meaning that they generally do not pay dividends in favor of reinvesting any earnings to accelerate growth. As such, traders are often willing to overlook elevated debt-to-cash ratios as tech companies add users or subscribers with the idea of ultimately enjoying larger profits in the longer term. Netflix, for example, often spends a considerable amount of capital each quarter producing and purchasing content, as well as driving subscriber growth overseas. Amazon, too, reinvests a huge percentage of its earnings into up-and-coming businesses segments, such as Amazon Web Services. But such investments tend to be riskier in the short run since the only chance investors have to capitalize on their investment is through its share price. And as rising government debt rates lure cash into safer assets, higher borrowing costs weigh on debt-heavy balance sheets. The Netflix logo is displayed on an iPhone 5s in this photograph taken in Washington. Netflix and Amazon fell 8.3 percent and 6.1 percent, respectively, on Wednesday. Netflix was up slightly in Thursday's premarket, while Amazon was down nearly 1 percent. But rising rates weren't the only thing weighing on Zaccarelli. "I've also spent most of the year thinking we'd get a trade deal with China, but over the last month or so I've become increasingly pessimistic," he said. "The Trump administration has gotten hard with its language, and it's clear they're not meeting with the Chinese." Trade tensions between the U.S. and China appear to have soured further over the past couple months, threatening to aggravate a slowdown in the Chinese economy. President Donald Trump imposed additional 10 percent tariffs on $200 billion worth of Chinese imports in September, with provisions for those duties to rise to 25 percent at the end of the year if the trade conflict remains unsolved. A deterioration in talks between Washington and Beijing have hit the tech sector especially hard given China's growing importance in the semiconductor market. Slowing in semiconductor equipment and chips is sometimes seen as a canary in the coal mine for global growth and tech. Micron, Qualcomm and Intel are among companies with the most revenue exposure to China, according to Strategas. Once some of the hottest trades on the Street, those stocks fell 1.5 percent, 4.8 percent and 3.7 percent Wednesday; chipmaker Nvidia shed 7.4 percent. The VanEck Vectors Semiconductor ETF (SMH) sank 4.5 percent and notched its fifth straight day of losses. As of Wednesday's close, Micron and Nvidia were down 35 percent and 16 percent from their respective 52-week highs. —CNBC's Patti Domm and Tae Kim contributed reporting.